As foodservice directors add “farmer” to the fine print attached to their titles, a major part of their job has evolved to include training their team to keep up on-site gardens. Here’s what some operators have learned through starting their own programs—prepare to get a little dirty. When it comes to gardens, it takes a lot of hits and misses before you can hit the ground running. At Amalie Arena in Tampa Bay, Fla., “It took us a good three to four months before we got it going,” says Bruce Ground, general manager for Delaware North. Flexibility was built into his training plan; his team experimented with black-eyed peas, okra and grape tomatoes to learn which plants worked with its plot. Now, his team is able to grow 800 heads of romaine each month of the growing season. For the first couple of months, the company who helped install Amalie’s hydroponic system visited the farm on a regular basis. Now, they come about once a month to give staff a refresher course. Shelby County Schools in Memphis, Tenn., partners with the Institute of Child Nutrition in Oxford, Miss. 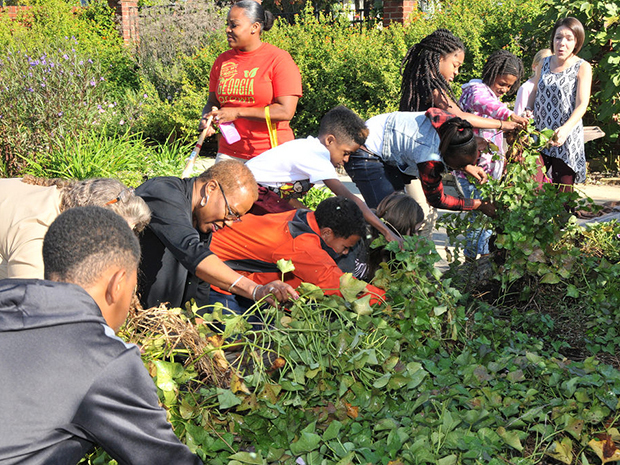 The education group creates training vignettes to give staff a rundown on gardening with food safety in mind, as well as controlling produce quality, says Jason Pipkin, planning and supply chain manager for Shelby County Schools’ nutrition services. Shelby also partners with Memphis’ Master Gardeners association for professional development courses for staff, and the district hired two farm managers with backgrounds in large commercial farming and agriculture. Those managers help educate not only foodservice staff, but administrators and teachers, the latter of whom are able to tie in core curricula to basic work duties on the farm. Create a plan of skills you need your team to learn and overall benchmarks for the garden, Pipkin says. For instance, decide on the goals of the program—will the focus be production, or education? Shelby County Schools’ focus is on the latter. “A lot of times the kids see the USDA or Sysco truck come down the street and think that’s where food comes from,” he says. Incorporate changing regulations into the training program, Pipkin says. Growing the produce is one thing, but making sure the food is safe is another. Pipkin found staying up on fluctuating safety guidelines was too much to have on his plate, and dedicated a member of Shelby’s team to track evolving regulations.